Now available in Spanish as Leyendas de los Maestros de Artes Marciales, in Czech as Legendy o mistrech bojových umení and in French as Légendes de Maîtres d’Arts Martiaux! This exciting collection is made up of twenty dramatic adventures–with heroes ranging from Tamo, a monk who lived 1,500 years ago, to Robert Trias, who lived into the late 20th century. 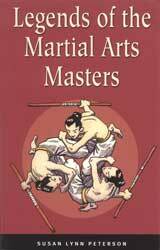 Filled with action, amazing feats, and martial arts wizardry, Legends of the Martial Arts Masters also promotes the virtues of discipline and courage to which martial artists aspire. The stories of how Gichin Funakoshi introduced karate to Japan, how Matsumura defeated a killer bull with guile instead of bloodshed, and how Musashi won a duel without drawing his sword will dazzle students of martial arts. Legends of the Martial Arts Masters is ideal for young readers interested in stories of courage, combat, and self-discovery.